NOT since the first President Johnson took office in 1865 has a presidency begun amid such tragedy and turmoil as Lyndon Baines Johnson's did when he took the oath of office on 22 November 1963 aboard Air Force One , parked on Dallas' Love Field. It was the plane that earlier in the day had brought President John F. Kennedy to the city on a trip that was to end with his assassination. In its somber aftermath, when President Johnson received at the White House the dignitaries from around the world who had traveled to Washington for Kennedy's funeral, he stood in a brighter limelight than any incoming president had ever had to endure. He faced the daunting challenge of succeeding a martyr figure and of competing instantly with that memory for the public's approbation. In attaining the White House, Johnson had fulfilled his life's ambition (as a mere twelve-year-old he had told his classmates, "Someday, I'm going to be president of the United States"), but he soon knew he would not inherit with his office the people's esteem. Many of the Kennedy faithful immediately and forever regarded Johnson as a "usurper" of Camelot, unworthy to sit in JFK's chair. Indeed, to them, the new man, notably less handsome and boyish than Kennedy, and "with a few gray hairs in his head" that Johnson liked to say were necessary in a chief executive, seemed virtually an impostor-president. They could not adjust to the Texas drawl hitherto unheard in the Oval Office, where it abruptly replaced the Boston-Harvard accent the nation had become accustomed to. Johnson even indulged a brand of humor that they found offensive: it was not witty and literary like their hero's, but often coarse and sometimes scatological. The keepers of the Kennedy flame gave the appearance of awaiting impatiently the advent of another of the Kennedy brothers to the presidency—and behaving meanwhile as if they represented a kind of government-in-exile. An extremely sensitive man with deep personal insecurities despite the macho image he projected, Johnson felt demeaned, as suggested by his often-repeated reminder, "I'm the only president you have." He lived with his nightmare that in the line of the presidents he would be remembered as sandwiched between two Kennedys. To be sure, Johnson had a host of admirers, too. Almost immediately he brought a new style to the White House, symbolized by the ending of haute cuisine dinners and their replacement by homelier American fare. Millions appreciated hearing about it. And many people everywhere seemed ready to see in Johnson's older, craggy face and in his long experience in Washington likely evidence of valuable experience and maturity. Finally—and not least of all—Lady Bird Johnson, the president's articulate and tactful wife, quickly won favorable attention which helped give reassurance to the country that this presidential couple was a satisfactory successor to the Kennedys. Johnson, who for years had been a dominating voice in the Senate, was immensely proud of his reputation as a legislative giant justly compared to the likes of Webster, Clay, and Calhoun. Yet he believed that as vice president, during the thousand days of the Kennedy administration, his talents had been forced to lie fallow. Now, by a sudden turn of fortune, he had the levers of power in his grip, and he fairly lusted to work them—aiming to make his page in history glow as brilliantly as any other president's. Lyndon B. Johnson, The Vantage Point: Perspectives of the Presidency, 1963–1969 (New York, 1971), is the president's memoirs, a team effort with loyalist writers. His My Hope for America (New York, 1964) is a campaign document containing his philosophy of government culled from some of his speeches. Lady Bird Johnson, A White House Diary (New York, 1970), is an impressive book of reminiscences based on the First Lady's daily talks into her tape recorder. Johnson's exchanges with members of the media are found in The Johnson Presidential Press Conferences , 2 vols. (New York, 1978). Irving Bernstein, Guns or Butter: The Presidency of Lyndon Johnson (New York, 1996), is the best one-volume treatment, elaborating masterfully how the Vietnam War undermined the Great Society. Vaughn Davis Bornet, The Presidency of Lyndon B. Johnson (Lawrence, Kans., 1983), covers the ground, although it is turgid in style. A lively and penetrating one-volume biography is Paul K. Conkin, Big Daddy from the Pedernales: Lyndon Baines Johnson (Boston, 1986). Robert A. Caro, The Path to Power (New York, 1982) and Means of Ascent (New York, 1990), are the first two volumes of a planned four-volume study, The Years of Lyndon Johnson ; it is sharply critical and enormously detailed. 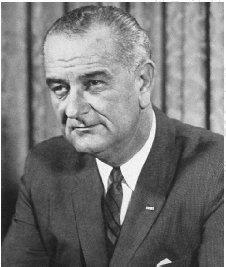 Ronnie Dugger, The Drive for Power, from the Frontier to Master of the Senate (New York, 1982), also critical, is based substantially on many interviews with LBJ; it is the first volume of a projected study entitled The Politician: The Life and Times of Lyndon Johnson . Outstanding on Johnson's early career, and elegantly written, is Robert Dallek, Lone Star Rising: Lyndon Johnson and His Times, 1908–1960 (New York, 1991). Leonard Baker, The Johnson Eclipse: A President's Vice Presidency (New York, 1966), is devoted to the most disappointing years in Johnson's public life. Philip Reed Rulon, The Compassionate Samaritan: The Life of Lyndon Baines Johnson (Chicago, 1981), evaluates the man with fervent praise. Alfred Steinberg, Sam Johnson's Boy: A Close-up of the President from Texas (New York, 1968), concludes that LBJ failed to grow in office. Merle Miller, Lyndon: An Oral Biography (New York, 1980), brings Johnson to life through taped recollections of friends and associates. Louis Heren, No Hail, No Farewell (New York, 1970), is a judicious evaluation of the Johnson presidency by the chief Washington correspondent of the Times of London. William S. White, The Professional: Lyndon B. Johnson (Boston, 1964), is a compelling portrait that served as a campaign biography. The best account of Johnson's election to the presidency is Theodore H. White, The Making of the President: 1964 (New York, 1965). For the family background, books by Johnson's mother and brother are available: Rebekah Baines Johnson, A Family Album (New York, 1965), and Sam Houston Johnson, My Brother, Lyndon (New York, 1970). George C. Herring, America's Longest War: The United States and Vietnam, 1950–1975 , 2d ed. (Philadelphia, 1986), is the best brief English-language history of the struggle. Herring's LBJ and Vietnam: A Different Kind of War (Austin, Tex., 1994), using newly released materials, exposes freshly some basic flaws in Johnson's management of the war. Stanley Karnow, Vietnam: A History , rev. ed. (New York, 1991), is a spirited, on-the-battlefield recounting. Another instructive review is Brian VanDeMark, Into the Quagmire: Lyndon Johnson and the Escalation of the Vietnam War (New York, 1991). Henry F. Graff, The Tuesday Cabinet: Deliberation and Decision on Peace and War Under Lyndon B. Johnson (Englewood Cliffs, N.J., 1970), presents the administration's rationale for fighting in Vietnam, based on extensive conversations over a period of years with the principal architects of the war. Frank E. Vandiver, Shadows of Vietnam: Lyndon Johnson's Wars (College Station, Tex., 1997), is an accounting of LBJ's performance as commander in chief. David M. Barrett, Uncertain Warriors: Lyndon Johnson and His Vietnam Advisers (Lawrence, Kans., 1993), aims to disentangle the sources of Johnson's policies. For a contemporaneous evocation of the atmosphere in which Johnson and his chief lieutenants made decisions, there is none better than David Halberstam, The Best and the Brightest (New York, 1972). The role of Johnson's secretary of state in the shaping of the Vietnam War is set forth unemotionally in Dean Rusk's memoir, As I Saw It (New York, 1990). The secretary of defense's belated recounting of the failure of the Johnson policies and of how early he knew they were wrong is in Robert S. McNamara, with Brian VanDeMark, In Retrospect: The Tragedy and Lessons of Vietnam (New York, 1995). Clark Clifford, with Richard Holbrooke, Counsel to the President: A Memoir (New York, 1991), recounts the author's labors as LBJ's second secretary of defense to begin winding down the war. Jack Valenti, A Very Human President (New York, 1975), is one of the best of the insiders' accounts, showing Johnson always reaching for lofty goals. Harry McPherson, A Political Education (Boston, 1972), is a superior set of recollections by a special assistant and counsel to the president. Joseph A. Califano, Jr., A Presidential Nation (New York, 1975), illuminates problems of the presidency as he saw them while serving as presidential assistant for domestic affairs. Califano's The Triumph and Tragedy of Lyndon Johnson: The White House Years (New York, 1991) gives an unsurpassed recital of Johnson at work on his legislative agenda. Doris Kearns, Lyndon Johnson and the American Dream (New York, 1976), is based on the author's experience as a White House fellow; psychoanalytically oriented, it purports to shed light on LBJ's relations with his mother. A penetrating appraisal of Johnson by his first press secretary is George Reedy, Lyndon B. Johnson: A Memoir (New York, 1982). George Christian, the last press secretary, covers sensitively Johnson's final hundred days in office in The President Steps Down: A Personal Memoir of the Transfer of Power (New York, 1970). Eric F. Goldman, The Tragedy of Lyndon Johnson (New York, 1969), derives from his experience as "intellectual-in-residence" at the White House and tells persuasively of the changes that overtook Johnson as the war progressed. Specialized studies on significant aspects of the Johnson years include Kathleen J. Turner, Lyndon Johnson's Dual War: Vietnam and the Press (Chicago, 1985), and Bruce E. Altschuler, LBJ and the Polls (Gainesville, Fla., 1990). The series on the administrative history of the Johnson White House published by the University of Texas Press contains W. Henry Lambright, Presidential Management of Science and Technology: The Johnson Presidency (Austin, Tex., 1985); James E. Anderson and Jared E. Hazleton, Managing Macroeconomic Policy: The Johnson Presidency (Austin, Tex., 1986); Neil D. McFeeley, Appointment of Judges: The Johnson Presidency (Austin, Tex., 1987); David M. Welborn and Jesse Burkhead, Intergovernmental Relations in the American Administrative State: The Johnson Presidency (Austin, Tex., 1989); Paul Y. Hammond, LBJ and the Presidential Management of Foreign Relations (Austin, Tex., 1992); and David M. Welborn, Regulation in the White House: The Johnson Presidency (Austin, Tex., 1993). William E. Leuchtenburg, In the Shadow of FDR: From Harry Truman to Ronald Reagan (Ithaca, N.Y, 1983), brilliantly illuminates LBJ's connection to Roosevelt in chapter 4. A good brief discussion of Johnson's economic policies by a former chairman of the Council of Economic Advisers under Presidents Nixon and Ford is in Herbert Stein, Presidential Economics: The Making of Economic Policy from Roosevelt to Reagan and Beyond (New York, 1984). Only slightly out of date is Lyndon B. Johnson: A Bibliography , 2 vols. (Austin, Tex., 1984–1988). Invaluable still is Robert A. Divine, ed., Exploring the Johnson Years (Austin, Tex., 1981), which discusses in eight essays by Johnson scholars the available literature on LBJ and the resources of the Johnson Library in Austin. A variety of finding aids, selected oral history transcripts, and descriptions of available recordings of Johnson's telephone conversations may be found by consulting the home page of the Johnson Library at http://www.lbjlib.utexas.edu . Recent works include Michael Beschloss, ed., Reaching for Glory: The Secret Johnson White House Tapes, 1964–1965 (New York, 2001); Robert A. Caro, Master of the Senate (New York, 2002), the third of Caro's planned four-volume study The Years of Lyndon Johnson, detailing LBJ's rise in the legislative body; Lloyd C. Gardner, Pay Any Price: Lyndon Johnson and the Wars for Vietnam (Chicago, 1995); Robert Mann, The Walls of Jericho: Lyndon Johnson, Hubert Humphrey, Richard Russell, and the Struggle for Civil Rights (New York, 1996); H. R. McMaster, Dereliction of Duty: Lyndon Johnson, Robert McNamara, the Joint Chiefs of Staff, and the Lies That Led to Vietnam (New York, 1997); and Jeff Shesol, Mutual Contempt: Lyndon Johnson, Robert Kennedy, and the Feud That Defined a Decade (New York, 1997). I have to express surprise at having my prose in THE PRESIDENCY OF LYNDON B. JOHNSON described as "turgid in style." Over and over during a long lifetime I have--on the contrary--had my prose described in reviews as "spritely in style." By the way, I have been successively a registered Democrat and moderate Republican over the years when living in the South and the West. It was in a Journal review when somebody found me a "Communist" to my total astonishment. Sometimes I wonder what comes over some scholars when they have the chance to characterize somebody else's book in a word or two!